At the moment of the Big Bang, the universe was bathed with light that quickly faded. But with the ending of the cosmic dark ages as the first stars began to shine, the universe moved out of the dark ages and into the age of illumination. Astronomers who want to study the cosmic dark ages face a fundamental problem. How do you observe what existed before the first stars formed to light it up? Theorists Abraham Loeb and Matias Zaldarriaga (Harvard-Smithsonian Center for Astrophysics) have found a solution. They calculated that astronomers can detect the first atoms in the early universe by looking for the shadows they cast. 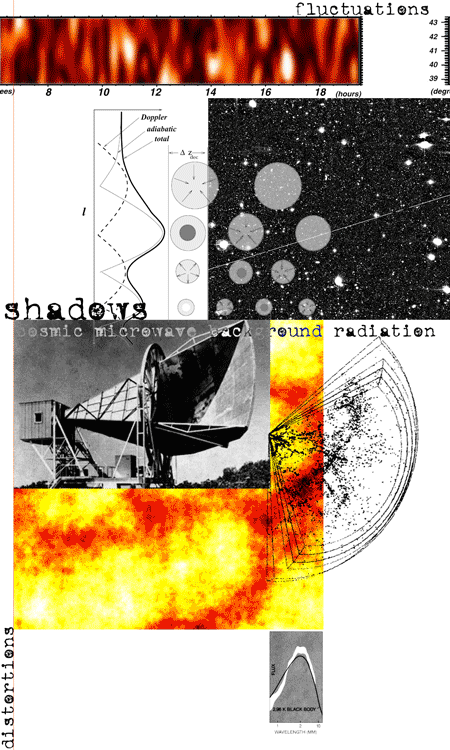 To see the shadows, an observer must study the cosmic microwave background (CMB) - radiation left over from the birth of the universe. The Big Bang filled the universe with light and matter. As space expanded, it cooled, and the light from the Big Bang dimmed as it was stretched to longer and longer wavelengths leaving the universe in darkness. When the universe was about 370,000 years old, it cooled enough for electrons and protons to unite, recombining into neutral hydrogen atoms and allowing the relic CMB radiation from the Big Bang to travel almost unimpeded across the cosmos for the past 13 billion years.